Despicable thieves have broken into the Beacon charity shop in Bloxwich Walsall in the early hours of 18 September stealing money from the safe and donations. The intruders also caused hundreds of pounds worth of damage and left a cruel message on the wall in their wake saying, “We robbed you”. The charity shop was forced to close while the police was called and the mess left behind was cleaned. 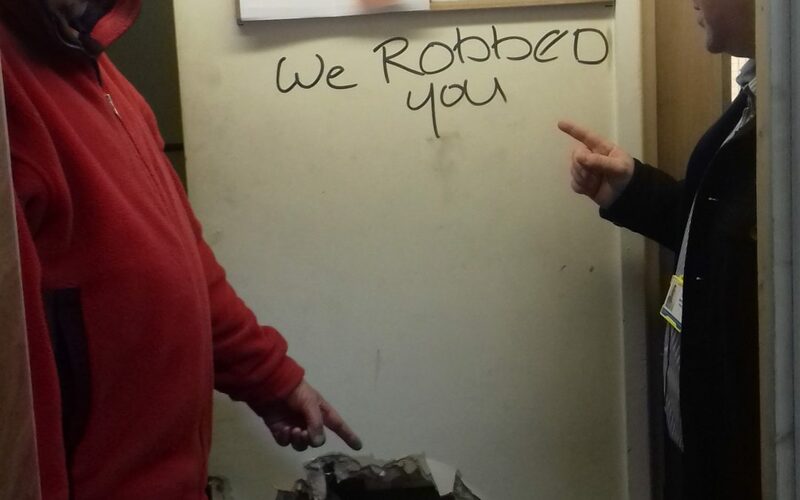 Thieves managed to take a safe that contained money and electrical goods which included a TV and a stereo – and unbelievably tea and coffee from the staff room was also taken. However, the brazen robbers did not stop at stealing money and goods. They also broke into staff lockers, broke furniture, ripped out and stole lino and chucked broken glass all over bridal dresses which the shop specialises in. Robert Evans, Area Retail Manager for Beacon, said: “When I got the call telling me the Walsall shop had been broken into I was shocked. I was of course concerned about what had been taken, but when I learned about the extent of the robbery and the vandalism I was disgusted. Beacon has thanked the public for its continued support and kind messages. In addition, Beacon has apologised for the temporary closure of the shop which is now open as normal. Anyone with any information about the break-in is asked to contact the police on 101.